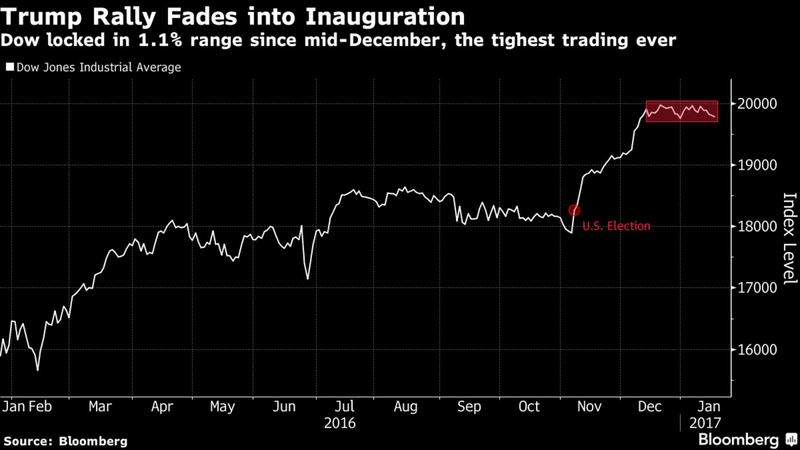 For U.S. stock-market investors, Donald Trump’s inauguration can’t come soon enough. The post-election rally that greeted the Republican’s surprise win effectively stalled after a month. Since then, American equities have churned in place, with the S&P 500 Index falling a measly two points since Dec. 13, and the Dow Jones Industrial Average locked in the tightest range in the measure’s 120-year history. After piling into stocks at a pace that added $2 trillion in value in the first five weeks after the election, investors grew more discerning as they began parsing policy proclamations for winners and losers under the new administration. That’s caused violent rotations under the surface, with banks and energy shares snapped up on expectations of looser regulations, while uncertainty over health and trade policies weighed on biotech and technology shares. We still don’t know very much about what will come after Jan. 20. That uncertainty is creating the churn we’re seeing. The largest unknown is just how President-elect Trump will prioritize and then negotiate the various pieces of his agenda. It’s only a mild stretch to say that ‘nobody knows nothing,’ at least for a few more days. “Trade policy is a source of worry” — David Kotok, chairman and chief investment officer at Cumberland Advisors Inc.
History is unkind to tariff and trade barriers when they are used in a policy-making form. And they usually have poor results when they incorporate complex tax structures like those proposed by Trump. Will the United States repeat the extreme approach of Smoot-Hawley in the Great Depression era? We don’t know, but we see few current references to that history. Remember, it was Smoot-Hawley that took a serious recession and turned it into a depression. Investors are anticipating that earnings will be 13.5 percent higher at this time next year. The catalyst? Everything you’ve been hearing about since Nov. 8: tax cuts, regulatory rollbacks, infrastructure spending and jobs, jobs, jobs. Assuming the forecasts prove correct, even though such estimates traditionally get revised down, the S&P 500 still appears between 5 and 10 percent too high, even if the earnings prognosis plays out. Companies and President Trump will have to pull a rabbit out of their hats. “Stock market tends to like a straightforward story” — Robert Landry, portfolio manager at USAA Investment Management Co. Many market watchers point to the sideways trading pattern starting in mid-December and declare that the so-called ‘Trump trade’ has run its course. We’re not so sure. The stock market tends to like a straightforward story, so if the new administration concentrates on its pro-growth policy actions, the narrative stays relatively simple and shares may find good reasons to continue their climb. But if other priorities compete for the president’s energy and focus — immediate repeal of the Affordable Care Act, creation of costly trade barriers and any number of foreign policy actions, just to name a few — the growth story could get muddled and the markets choppy.